Because we live in the sticks, take outs are usually more hassle than their worth. This recipe is so much nicer than the strangely orange product that most Chinese take outs produce, you might never bother to order it again. This is a big family favourite in our house, it is the perfect balance of sweetness that the kids will enjoy and yet is a great way to introduce more exotic flavours. The pineapple adds another great reason that mine love this and due to the colour the every fussy child often inadvertently eats some yellow peppers….a win-win for me. The meat in this dish turns out succulent and sweet….and very morish! 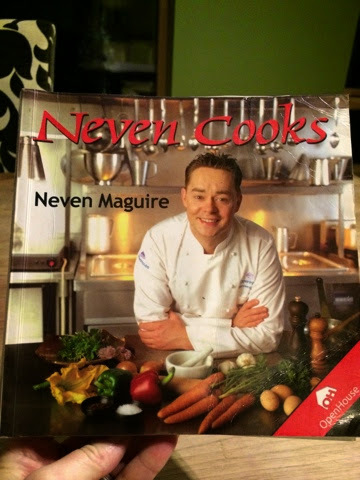 The original recipe is from one of Neven Maguires very early books, they are small, the food styling is dated, but the recipes are fantastic, they work, they are not ‘cheffy’ and I’ve cooked so many of them over the years. I’ve only changed the quantity slightly to get a richer sauce. Give it a try, I’d love to hear how you get on. Melt some butter in a large heavy bottomed saucepan or casserole dish. Add the onions and peppers and cover and allow to soften for about 10 mins. While this is cooking, slice the pork steak into small strips. Heat a frying pan to high with a tablespoon of rapeseed oil and brown the pork in batches. When the onion and pepper mix has softened add the garlic and ginger and cook for another minute or two. Now add the pineapple, vinegar, sugar, tomato purée, soy sauce and stock. Cook this for 10 minutes. Check for taste, if it’s too sweet add more vinegar, if too sour add more sugar. When happy, mix the cornflour with a small bit of water and mix until smooth, add this to the sauce to thicken. Now add in the pork, turn the heat down and simmer for 25 mins or so. Mix the rice into the melted butter. Add the turmeric, which will give a lovely yellow colour, if using. Add the 2 pints of stock. Cover and place in the oven for 18 mins. Remove from oven and fork through. Oh this sounds fab! I make a very simple version that I got from an Anabel Karmel book but it's only OK. This sounds absolutely gorgeous – can't wait to try! I hope the little people in your house enjoy it, I know kids are a tough audience at times!! Here is another who will be trying this recipe! And completely agree with Gwen! Would love to hear how you get on, it's a favourite here…which means I'll probably cook it far too often and the kids with turn against it!! 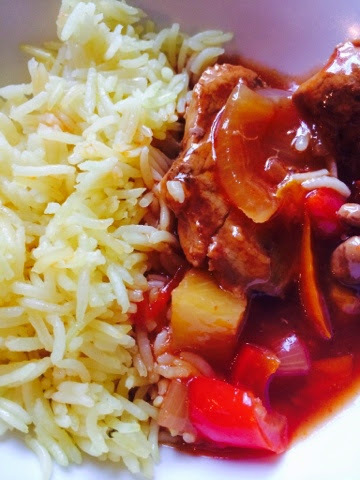 Hmm, this looks great!Thanks for sharing.I'm always on the look out for DIY takeaway recipes as find the Chinese restaurants in Galway really greasy and not very tasty!